I booked two tickets on the direct Deutsche Bahn (ICE 93) train from Berlin to Vienna and the seat information is shown as - "Side-by-side seats Carriage 27, seats 13, 15". I would normally have expected the seat numbers to be continuous, e.g. "13, 14" or "14, 15", although I have never travelled by train in Germany so do not know the seat number system. Unfortunately, we don't have access to the seat plan of this train, so there is no way for me to confirm or deny if you are next to each other. Usually, when you're booking for multiple passengers at the same time, the system automatically tries to put them together(if possible), or the at the very least close to one another. Could someone confirm that the seats are indeed side-by-side (and also not separated by the aisle)? Also, if anyone could show the seats on a seating plan that would be helpful. 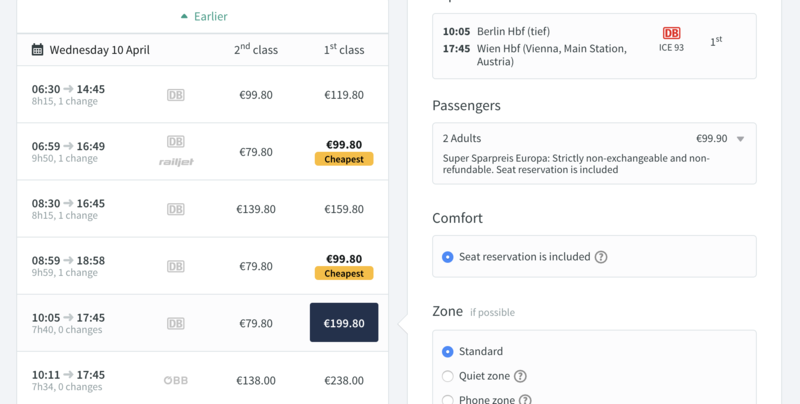 You can check this by trying to book a reservation on bahn.de - Select "Reservation only" on the main page, then search for your train, try to make a reservation (without logging in), click on "select seat" and the layout of the coach will be shown. For the 20th of December, an ICE train type is used for which seats 13 and 15 are next to each other and appear to be 1st class in Coach 27. Due to copyright reasons, I cannot include the seat plan shown on bahn.de here. 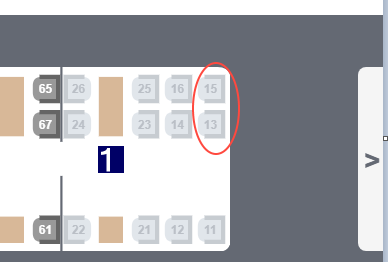 I am not sure if that is the case for all ICE types, but normally, seats 15 and 13 should be next to each other. The numbering scheme comes from the old days of vis-a-vis compartment seating and was just continued to be used when compartments were no longer used. If it's an ICE 2 or ICE-T-7, then seats 13 and 15 in car 27 are adjacent. Not the answer you're looking for? Browse other questions tagged trains germany seating or ask your own question. Do gate agents really seat young children away from their parents in United Basic Economy? Does the price of the same international train ticket in Europe vary by country? When traveling by train in Finland what can I expect from these options?